great in a staged home, either indoors or out, holding real plants or silks. 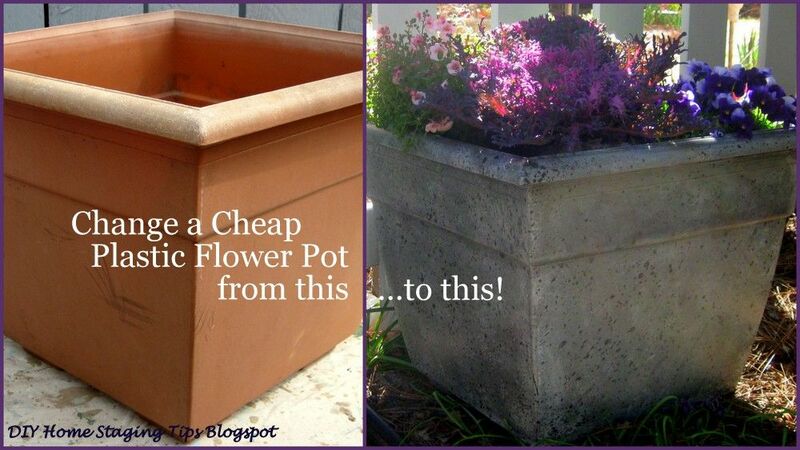 Take one cheapo plastic flower pot and turn it into a classy cement planter. Magic? No, it's just paint, and you can do it yourself, even if you've never done faux finishes before. Don't let the French word scare you. 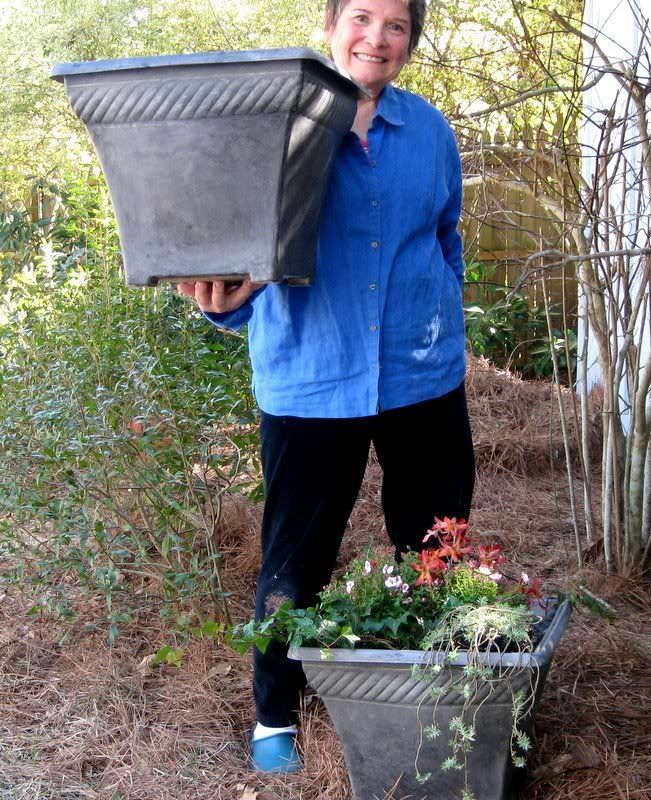 Here's my Step-by-Step for creating the flower pot pictured above. It's a quick and easy DIY project. Doing this project outside is best. 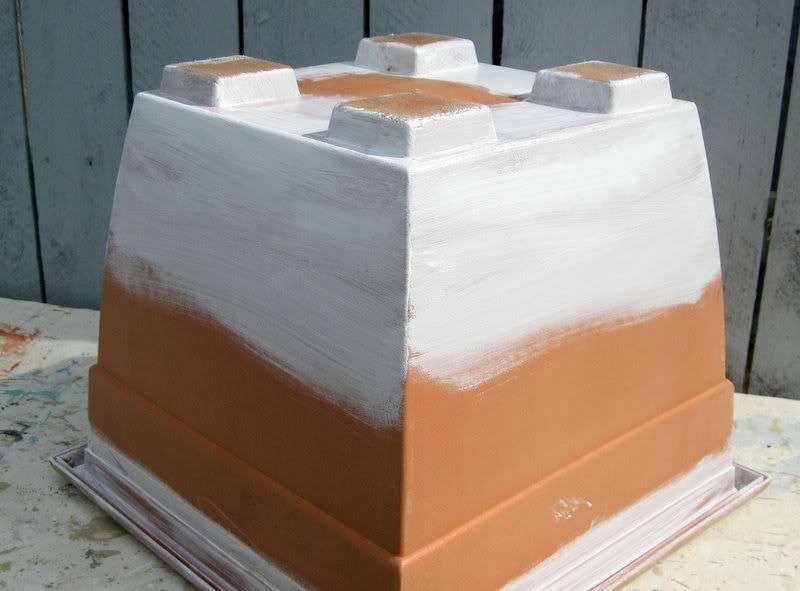 The paint will dry more quickly with better air circulation, and you'll have fewer surfaces to protect. However, if it's above 70 degrees, find a shady place or wait for a cooler time because the paint can dry too fast. Here's what you need. Cover your work surface with a dropcloth to protect it. 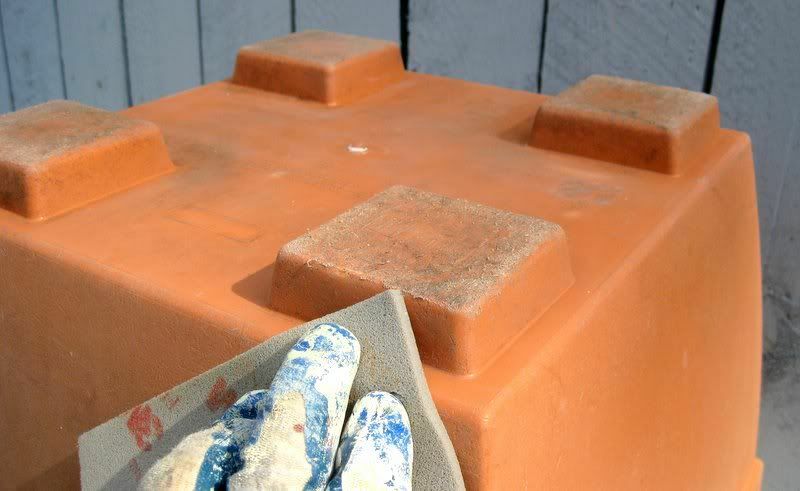 Using a dry rag, wipe the container to remove any loose dirt, including the inside. Put on your gloves. Sand the container's outside surface. 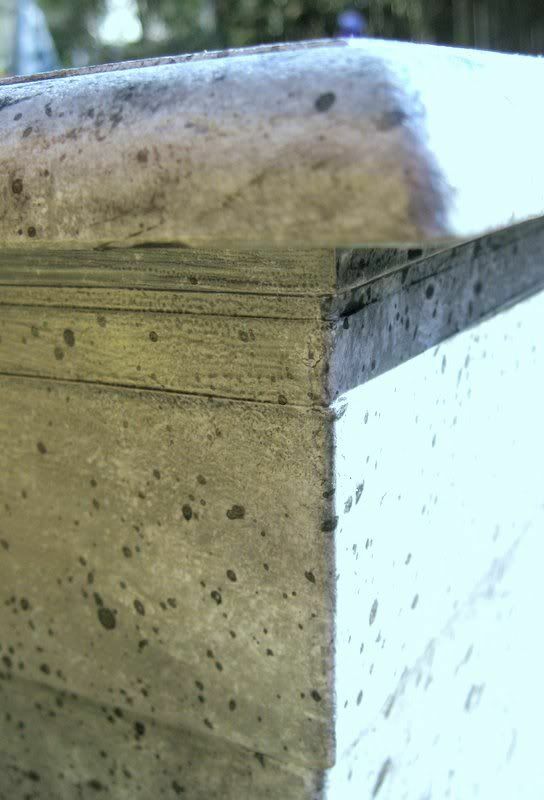 Sanding will give the surface "tooth" to help paint adhere better. As you can see, I am recycling an old container. The container you faux finish needn't be new, but it needs to be clean. Invert the planter and start at the bottom. 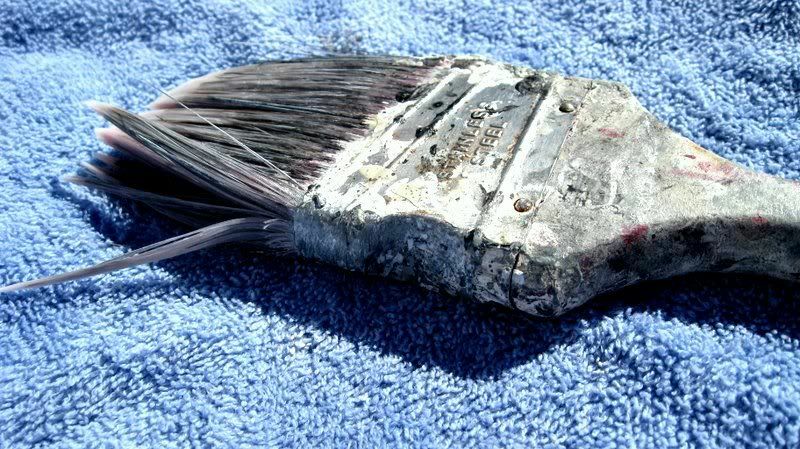 Brush on paint. It will dry quickly, especially if you are working outside and it is warm or windy. 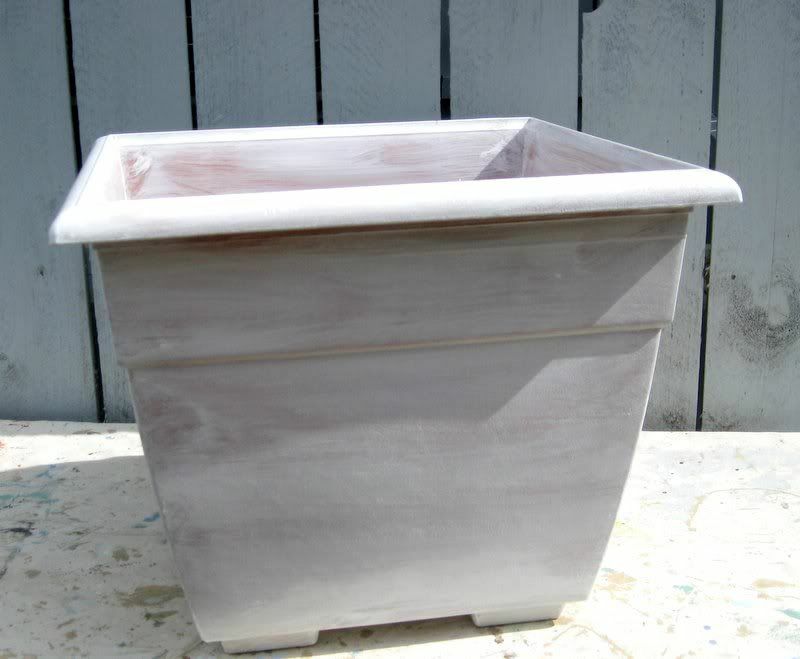 If the planter has feet, paint all sides to be sure none of the old color shows when you are done. 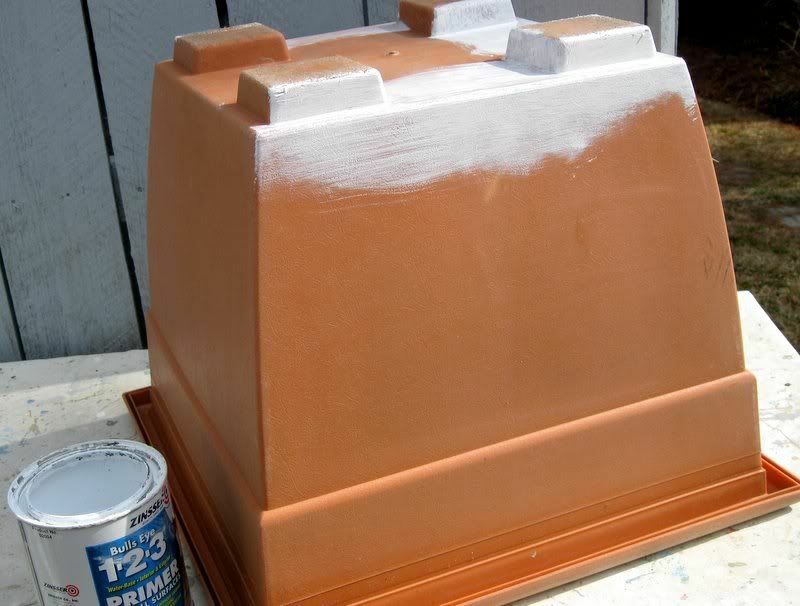 Paint the bottom half, and the underside of the top lip before you set the planter right side up. rotate the box from the top lip. 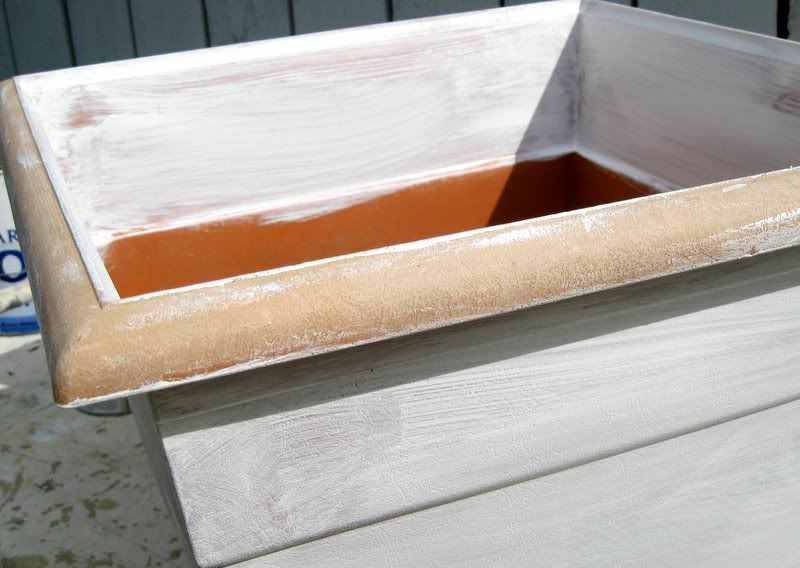 Paint inside the top edge, which will be visible even after the planter is filled. 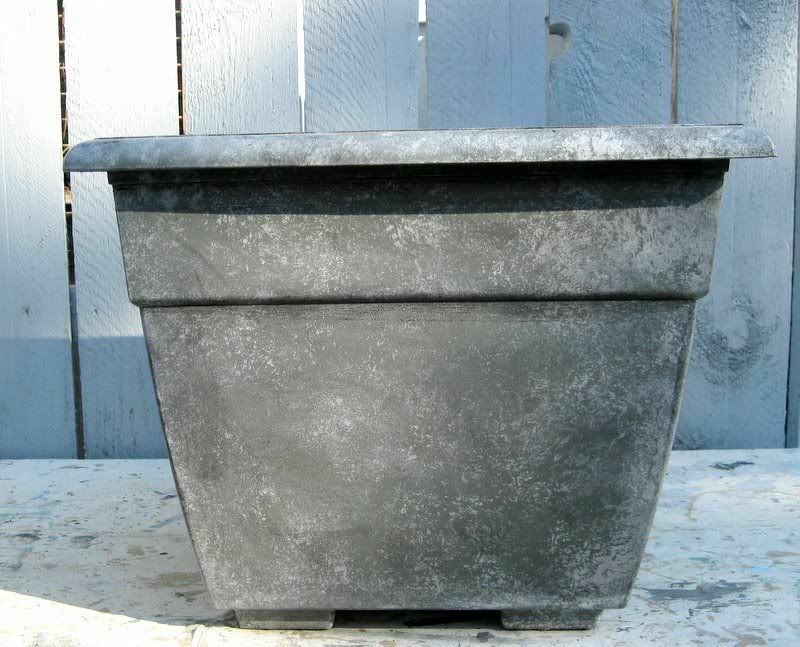 Your primed planter will look like this. Don't worry about coverage. You're just making sure the next coat sticks. Check for drips and runs before the prime coat dries. Follow the same steps as the prime coat, starting at the bottom when the planter is inverted. 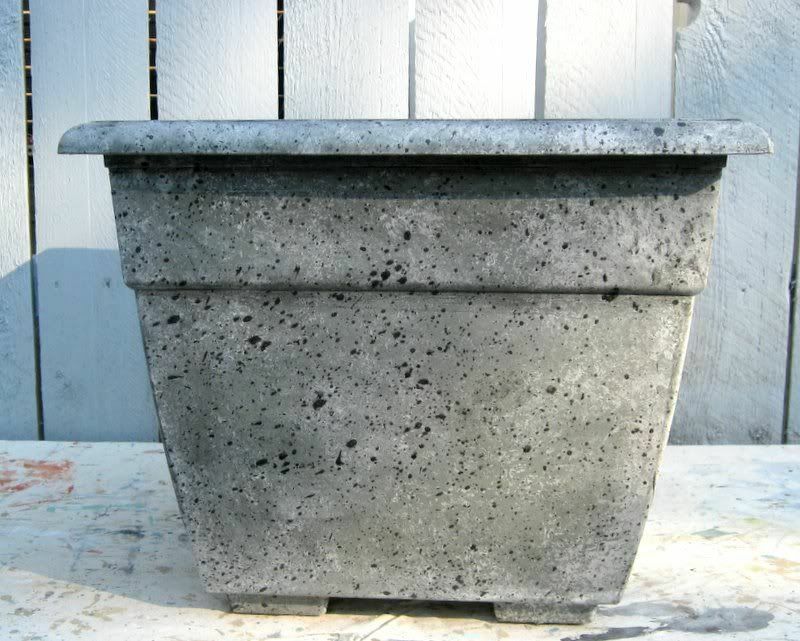 Your planter should look something like this when it has an even coat of grey as a background. Dampen the sponge. 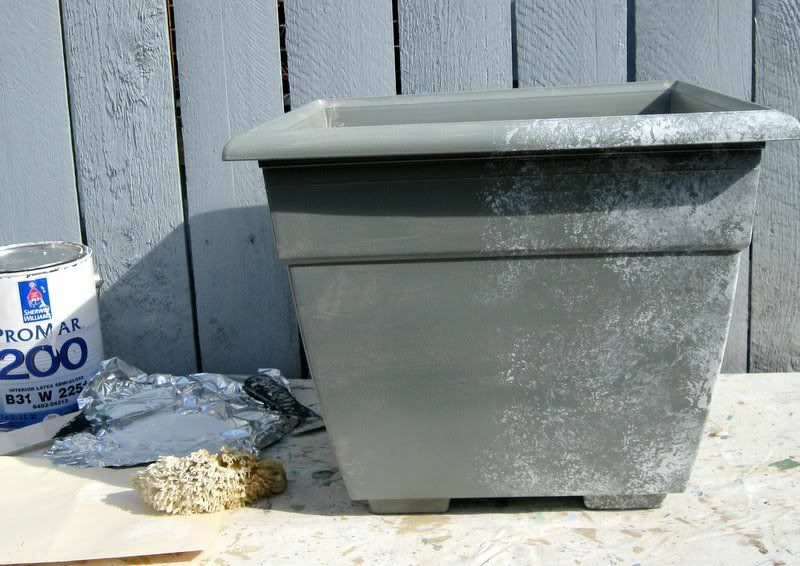 Pour a small amount of white paint into the plastic bucket. Add an equal amount of water and stir. 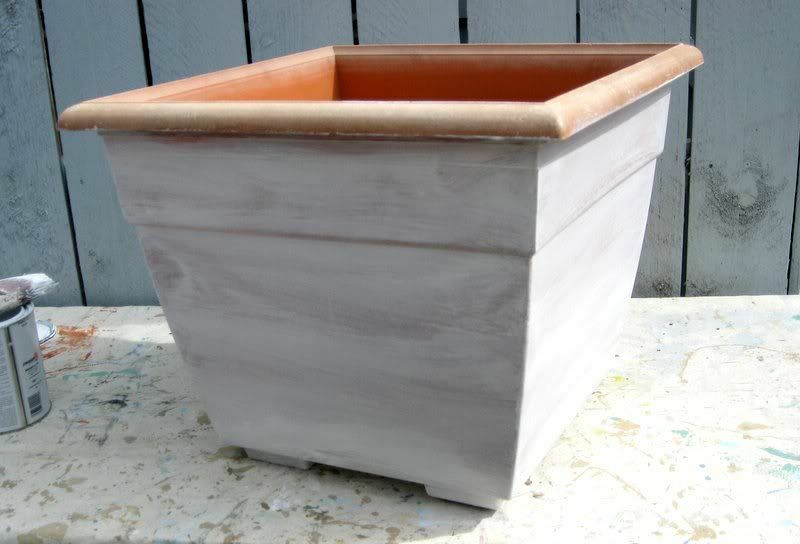 For my planter, which measured 15 inches tall, I used less than 1/4 cup of white paint for sponging. Dab the sponge into the paint and then dab most of the paint off onto a piece of cardboard, disposable plate, or aluminum foil. 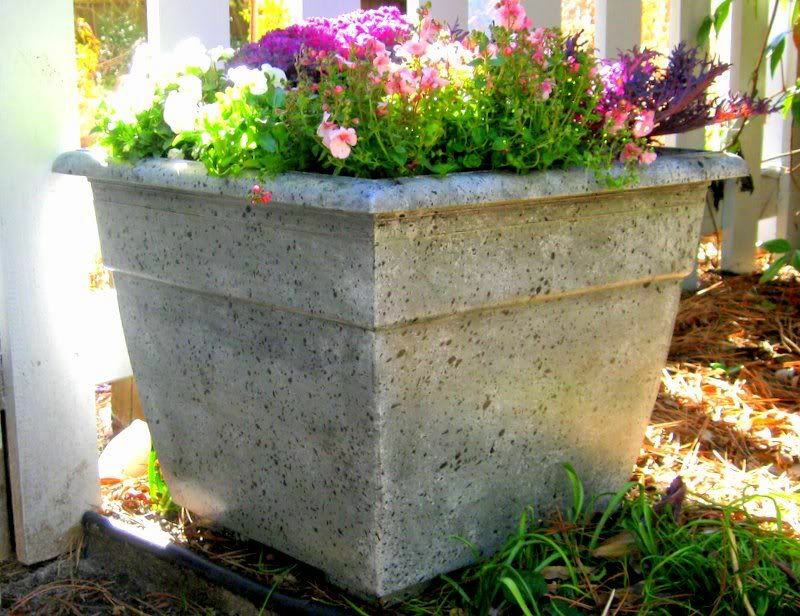 Practice on the interior of the planter until you get the feel of sponging to simulate texture. Lightly dab paint onto surface, moving the sponge around to create a random pattern. I used a piece of aluminum foil to remove excess paint from the sponge. Overlap the sponging pattern, and leave some areas grey. After the entire surface is randomly sponged with white, wash your sponge well and put it away. 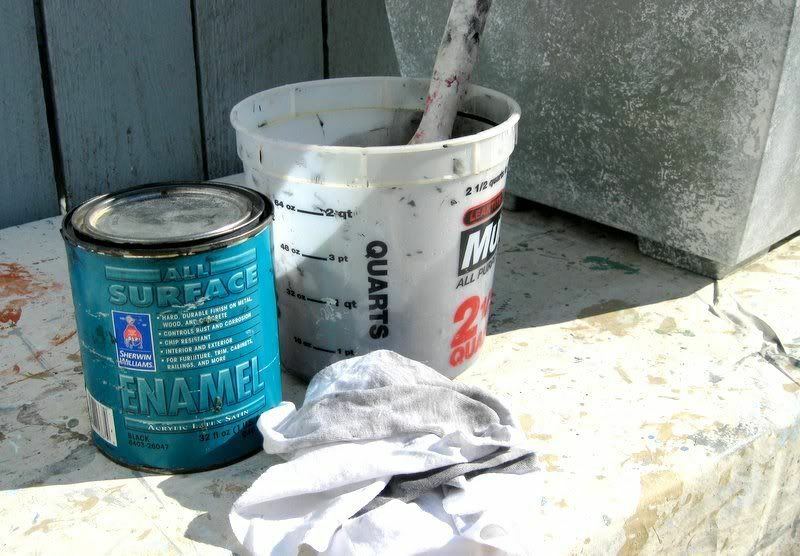 Wash the plastic bucket, and use it to mix a small amount of black paint with an equal amount of water, about the same amount as you mixed of white paint. 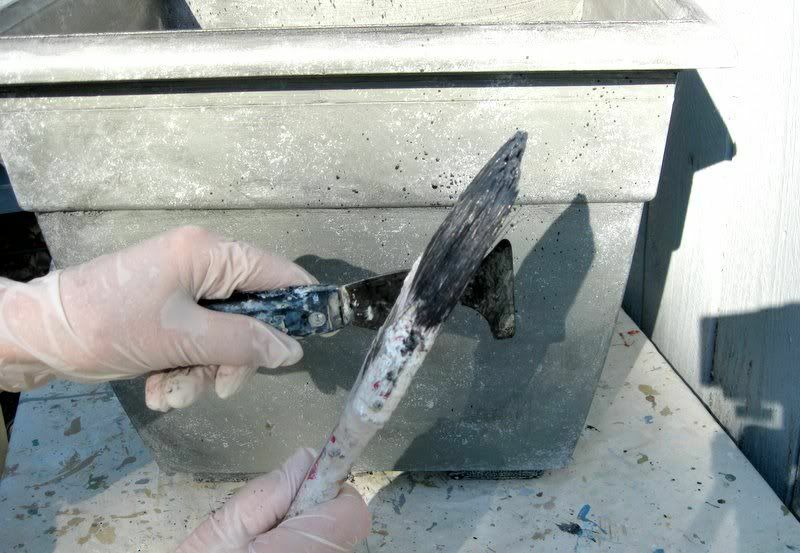 Brush the entire painted surface with the diluted black paint. It should settle into any groves and crevices. Lightly wipe the surface to remove most of the black wash. It should give the planter a slightly aged look. Have a rag ready to wipe off the diluted black paint. The wash will look like this when you brush it on. Don't worry about coverage, but make sure black paint gets into crevices. 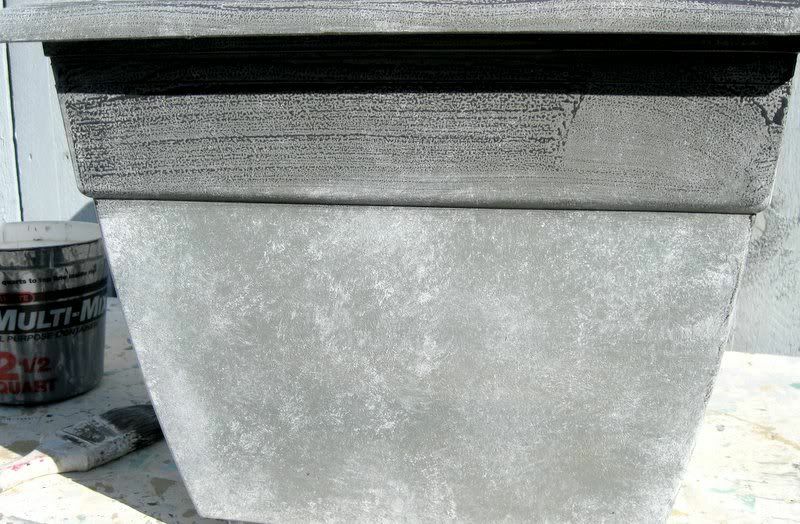 After the black wash is wiped off, your planter will have a softer look. The paint should dry quickly. This can get messy, so protect any adjacent surfaces. Using the same black wash, load your brush with it, and then remove most of the paint. Rap the brush sharply against a screwdriver or 5-in-1 tool to make a splatter pattern of black paint on the planter. 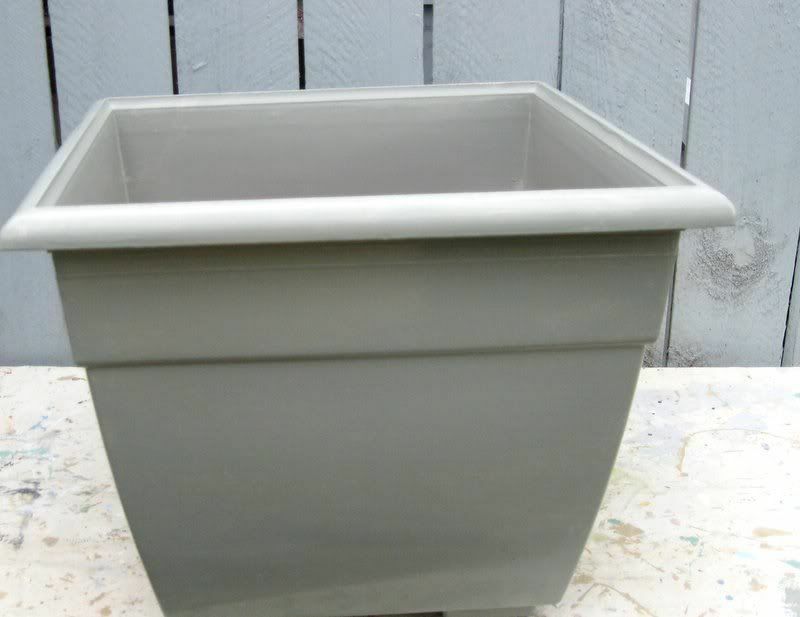 Rotate the planter to do all sides, including inside the top edge. 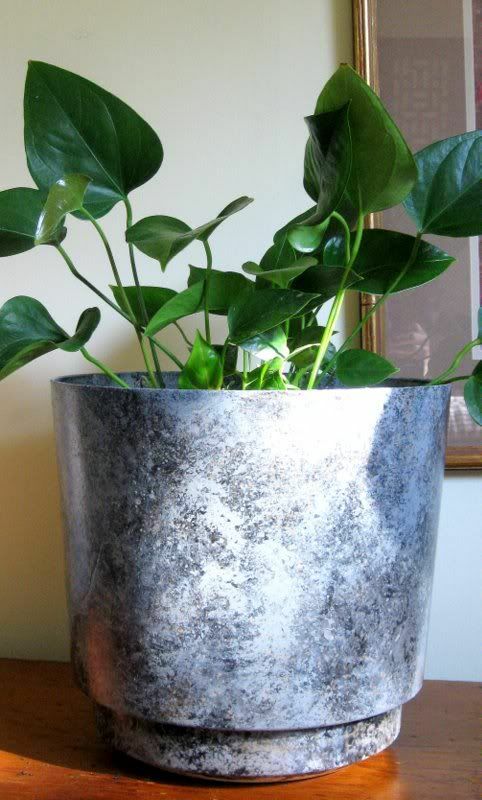 You may choose to position the planter on a cardboard box and walk around it rather than rotate it. Aim for a random but all-over splatter pattern. If some drops are too large or look more like streaks than dots, use a rag to dab them away while they are still wet. Practice your splattering technique on the inside of the planter before you do the outside. Keep the brush at least a foot away from the surface. splattering or a little. I can imagine two of these, each with a topiary on either side of a front door. It's optional to cover your work with a coat of clear sealer. 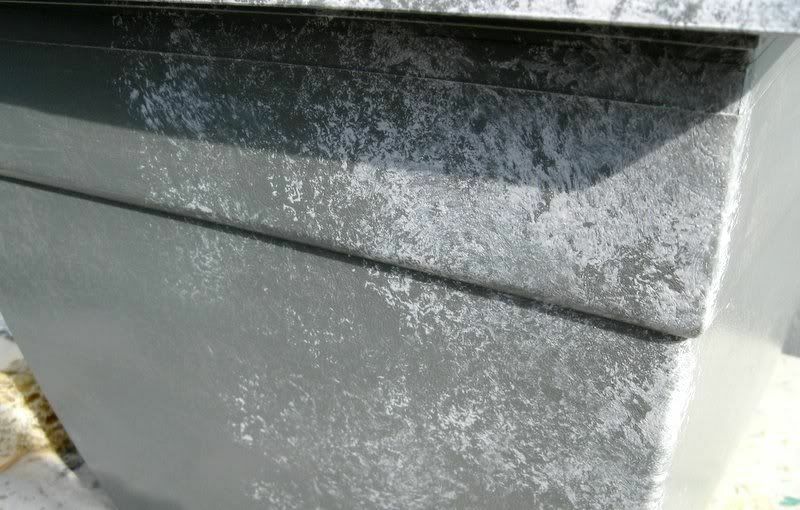 It can give the paint an extra layer of protection if used outside, and it can add a subtle sheen to the finish. 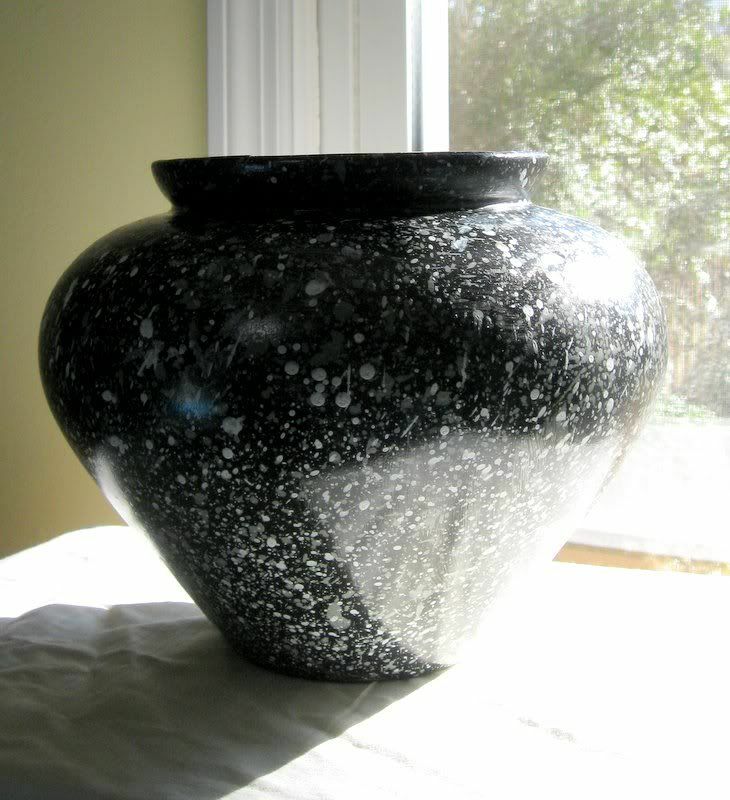 I sprayed a coat of clear satin finish on this planter to make it look more granite-like. This is a resin pot that I faux finished with pinkish undertones. You can choose natural stone colors that work with the colors of your staged home. 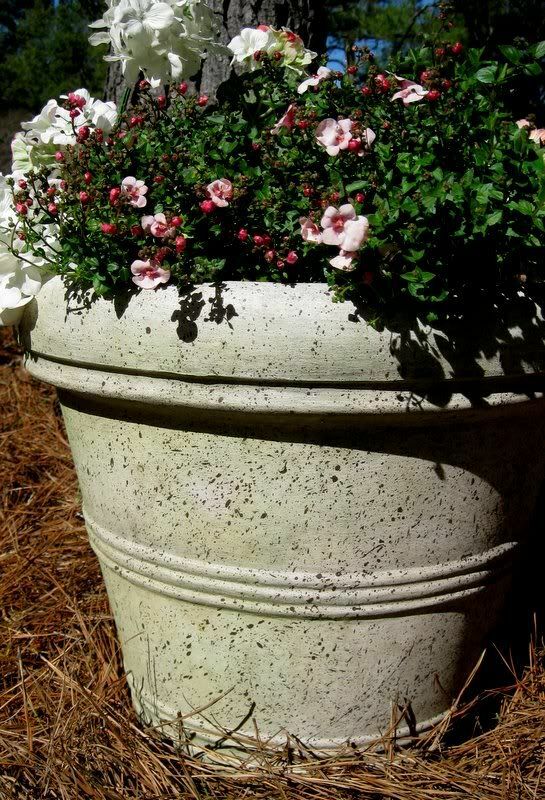 Ordinary plastic flower pots for indoors are perfect for faux stone finishes. Just prime, sponge and glaze. Even glass vases can be converted to stone planters. Look for classic shapes like this one. I paid just $8 each for these planters at Big Lots. They were plain brown plastic. One great thing about plastic pots is that when you move, they're lightweight so they're easy to take with you. This is why I suggest using an old or inexpensive paint brush. The splattering will destroy it. The side of my brush is all banged in and the bristles are splayed. Save your Purdy. You're just a few steps away from creating an impressive but thrifty staging prop for your home. 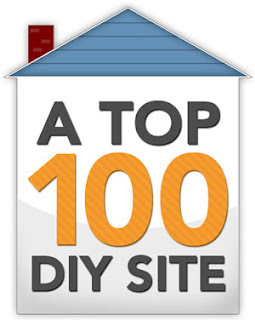 And help yourself to more ideas and instructions for DIY projects in my $4.99 eBooks. 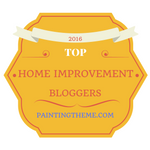 Surprise yourself with what you're able to do to stage and decorate your own home!